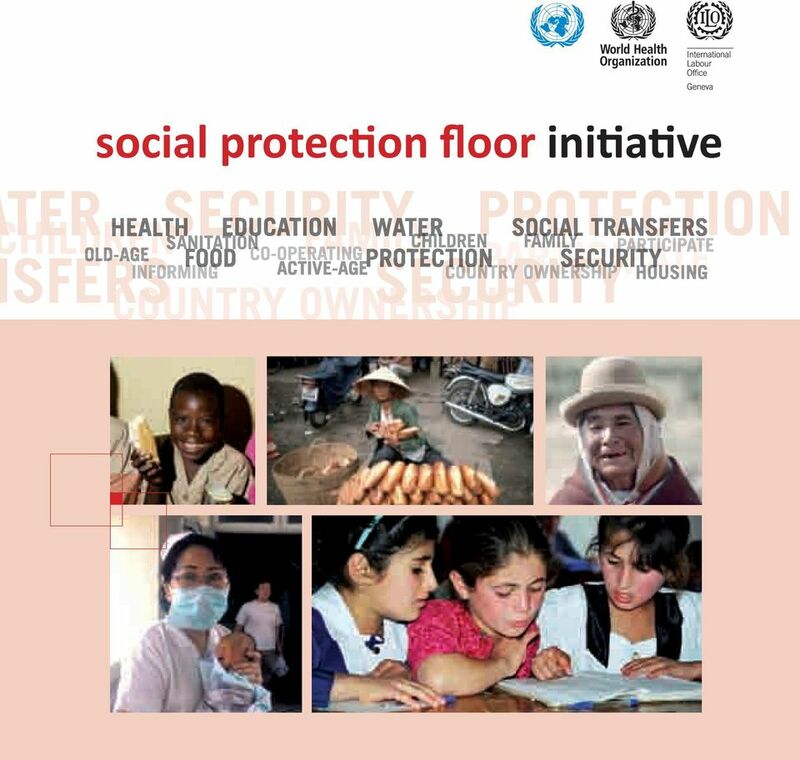 Download "social protection floor initiative"
4 4 SPF country-level operation Each country is facing different circumstances, social needs and fiscal constraints and will choose a distinct set of policies to achieve its development objectives. The national social protection floor policies will thus be country-defined and the implementation process countryled, also ensuring affordability at the national level. The SPF-Initiative does not create additional parallel processes at country level but rather establishes SPF policies as an integral part of existing national, regional and UN planning processes. 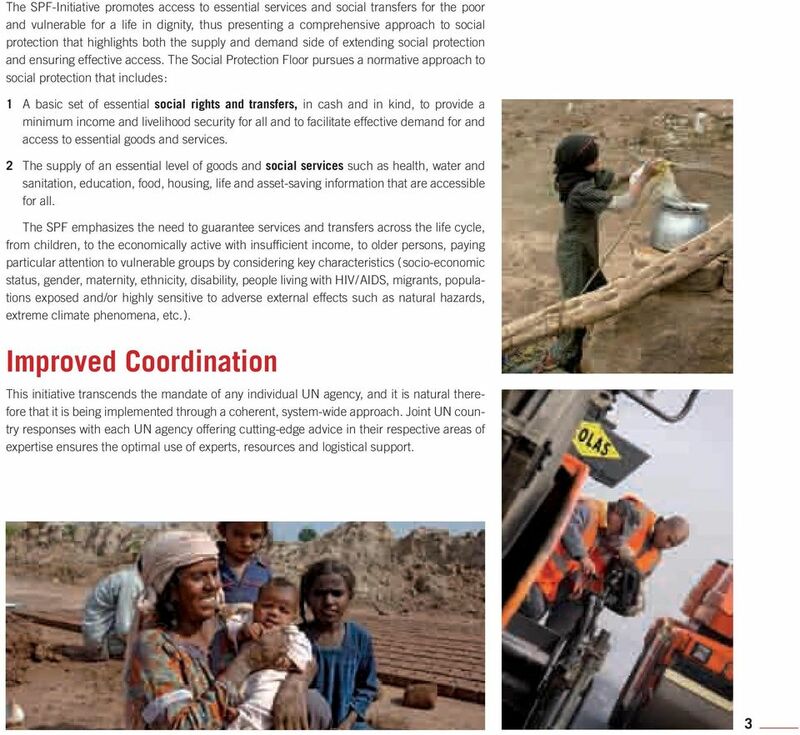 For example, the Social Protection Floor concept supports regional commitments to social security, such as the 2009 AU Social Policy Framework for Africa or the country level social protection programmes in South Asia. National SPF processes are consultative, inclusive and participatory in nature, involving all stakeholders including representatives from the relevant government ministries, social partners, parliamentarians and civil society through social dialogue. 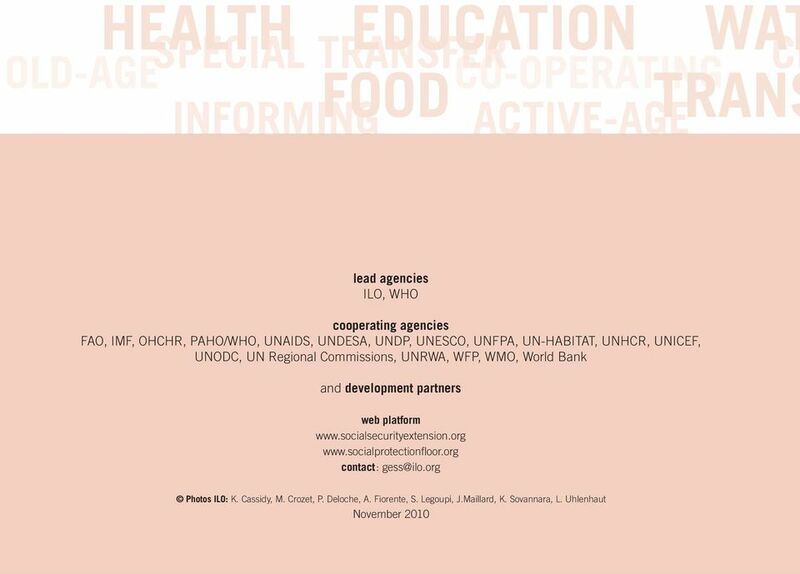 The constitution of a Global SPF Advisory Network, the SPF manual providing guidance for joint SPF country operations, and the SPF website for sharing knowledge and experiences are key elements to foster and ensure efficient and productive cooperation between the relevant organizations under the umbrella of the joint UN initiative. 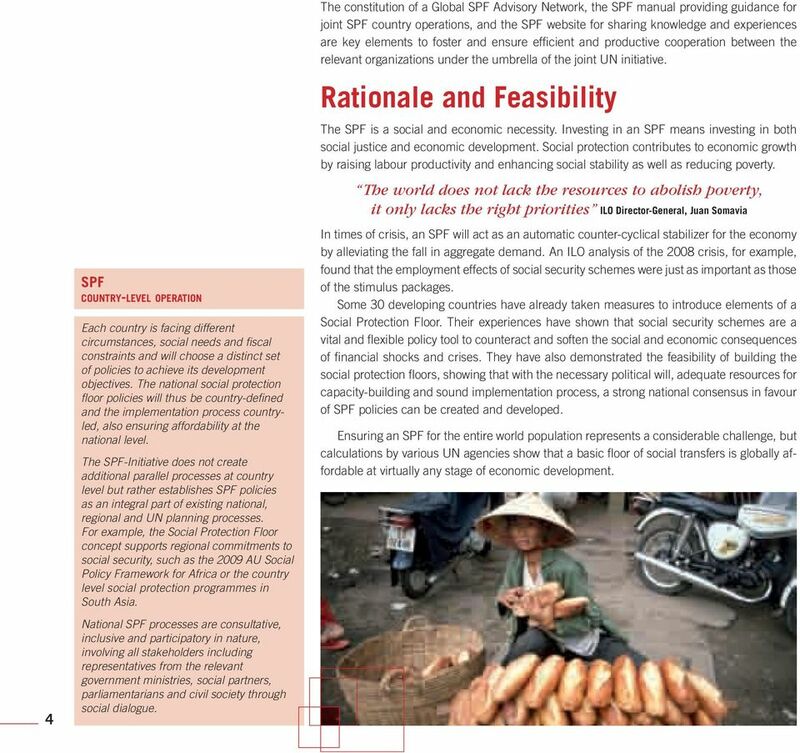 Rationale and Feasibility The SPF is a social and economic necessity. Investing in an SPF means investing in both social justice and economic development. Social protection contributes to economic growth by raising labour productivity and enhancing social stability as well as reducing poverty. The world does not lack the resources to abolish poverty, it only lacks the right priorities ILO Director-General, Juan Somavia In times of crisis, an SPF will act as an automatic counter-cyclical stabilizer for the economy by alleviating the fall in aggregate demand. An ILO analysis of the 2008 crisis, for example, found that the employment effects of social security schemes were just as important as those of the stimulus packages. 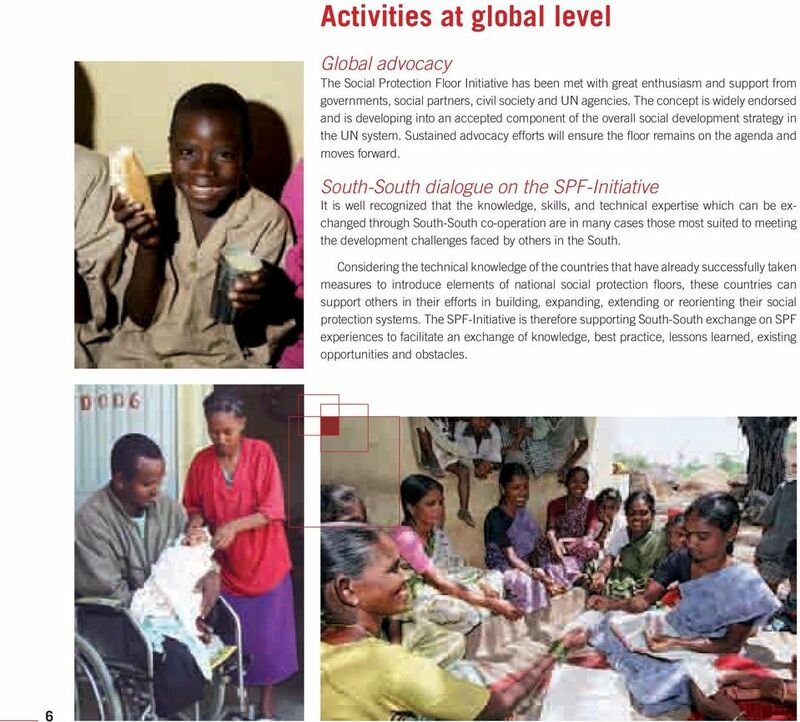 Some 30 developing countries have already taken measures to introduce elements of a Social Protection Floor. 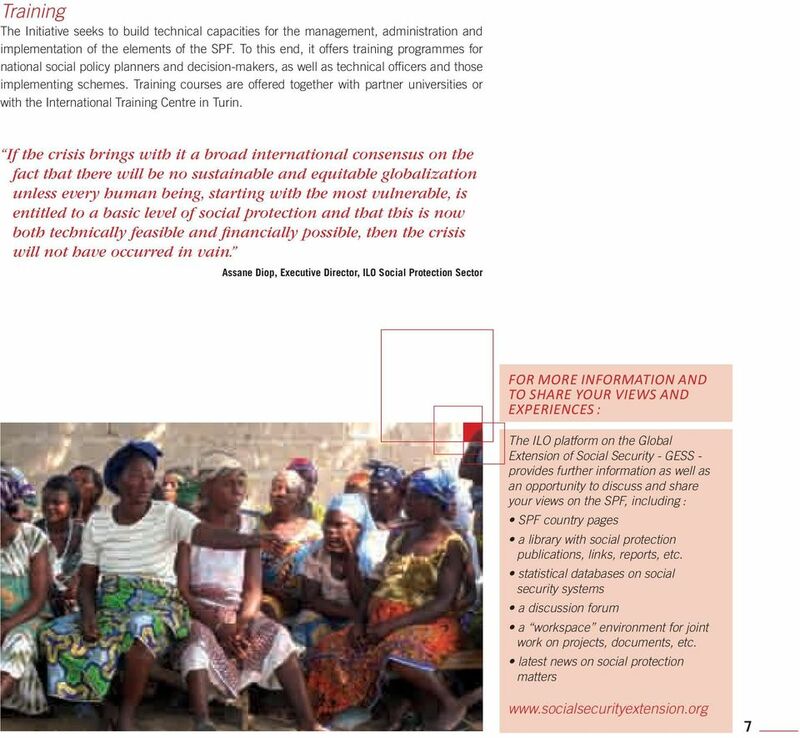 Their experiences have shown that social security schemes are a vital and flexible policy tool to counteract and soften the social and economic consequences of financial shocks and crises. 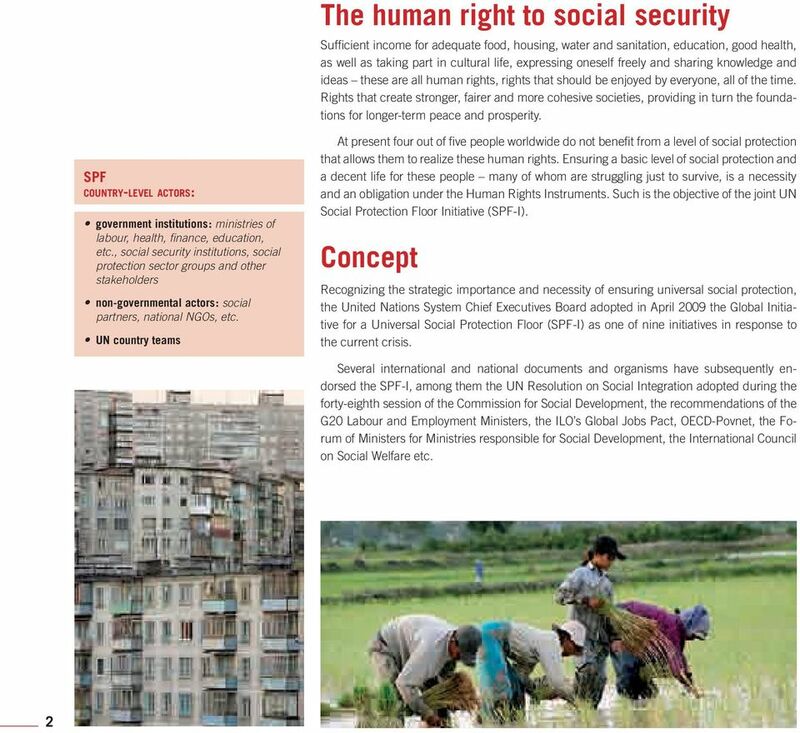 They have also demonstrated the feasibility of building the social protection floors, showing that with the necessary political will, adequate resources for capacity-building and sound implementation process, a strong national consensus in favour of SPF policies can be created and developed. Ensuring an SPF for the entire world population represents a considerable challenge, but calculations by various UN agencies show that a basic floor of social transfers is globally affordable at virtually any stage of economic development. 12th African Regional Meeting. Yaoundé Tripartite Declaration on the Implementation of the Social Protection Floor. Governance and development Thematic Think Piece UNDESA, UNDP, UNESCO The views expressed in this paper are those of the signing agencies and do not necessarily reflect the views of the United Nations. Therefore, AGE Platform Europe would be pleased if the Committee could take into account the following amendments. Human Development, Health and Education Dialogues at the Economic and Social Council CONTENTS FOREWORD BY H.E. AMBASSADOR IVAN ŠIMONOVIC, President of the Economic and Social Council XI PREFACE BY MR. Session 1.2: What is social protection and what can it do? Presentations by panellists were followed by a dialogue with members of the Council. These discussions are hereunder summarized.